Opening Lines: Sally wakes up when she hears the front door close. She rises slowly from her bed, careful not to strain her aching joints. Synopsis: (from the flap) Sally the black Labrador has had many wonderful adventures over the years. But now she is tired and ready for a rest. After falling asleep Sally opens her eyes and discovers she’s in heaven. She’s sad to leave her family behind but soon finds that heaven is filled with new and exciting places to explore. There are lots of friends to make, meatballs grow on bushes, and – best of all – there are no leashes! Why I like this: A beautiful tender story from a dogs view of life after death. A wonderful way to reassure children that their dog or pet would find happiness, no pain and enjoy so much when they have gone from this life. Sally finds she is able to bounce around no longer feeling the bangs of old age and she can eat all her favourite food like ice-cream. 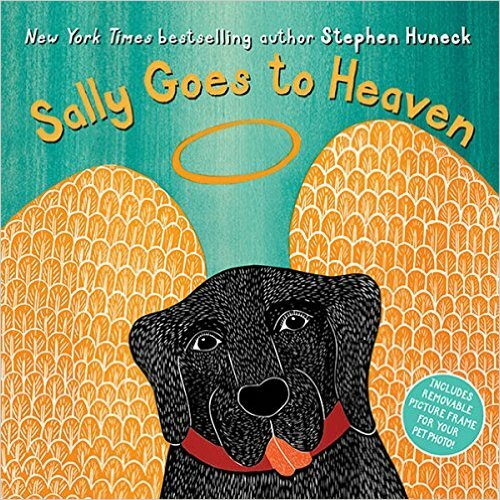 It is lovely how the author also includes that Sally hopes the family she has left behind will find another dog to play with and look after them, and in doing so teaches that life does go on. Stephen, author, artist, and sculpture, had such dedication, love and respect towards dogs and wrote beautiful books for children of everyday life based on his own dog, eventually built a chapel for dogs and dog owners so the dead could be remembered. He himself took his own life in 2010 and his wife who tried to keep his legacy going died three years later. This entry was posted in Picture Book Review, Reading Aloud and tagged lost pet, Perfect Picture Book - Friday, Stephen Huneck, Susanna Leonard Hill. Bookmark the permalink. So glad you posted this. I was looking for a book I could give to someone who really needs this. Thanks! Your welcome Julie. Hope this will be of great help. Oh wow. I think this book will make me cry. It sounds like the author handled this wonderfully. Thanks for the review. Your welcome Penny. Yes it is sad but it is joyful too. It helps the child realise that his pet will be happy now, not in any pain enjoying all the great things that heaven has to offer. What a reassuring book for children. Animals seem to know when it’s there time to leave and will go seek a favorite tree or place and go to sleep. But, I love the message for children. This is a different take on most pet grief books. So positive! Thanks for sharing.